Business education teacher Marcus Robinson expects to wow his students with a new tech tool when they report to his class at E.D. Walker Middle School this year. Robinson is one of hundreds of district teachers whose classrooms will be equipped with interactive touch screens provided by the district’s IT and Career and Technology departments. Each of the 23 collegiate academies are receiving 11 of the units funded by the 2015 Bond Program, and select campuses are receiving theirs compliments of the Career and Technology department. Robinson, who teaches entrepreneurship and professional communications, talks excitedly about the potential of the teaching tool and sees it as “transformational” in his efforts to engage students. 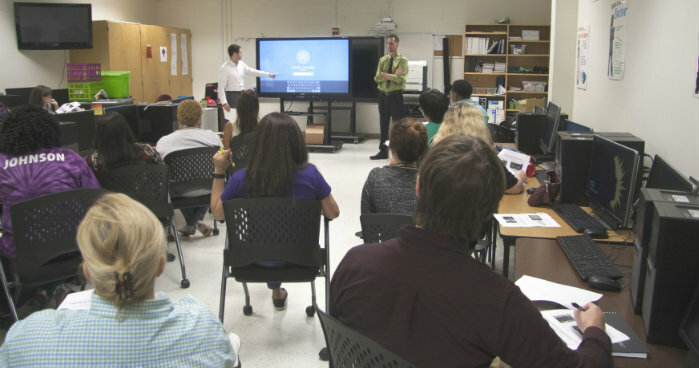 Robinson was one of 20 teachers who attended a Thursday training session conducted by Newline Interactive, manufacturer of the TruTouch Interactive Displays being rolled out in Dallas ISD classrooms this fall. About the size of a large chalkboard, the 70- to 86-inch interactive displays are similar to flat screen televisions with the added benefit of touchscreen technology that makes chalkboards look absolutely ancient. Teachers saw how the displays can greatly expand their capability to share information with students. They can either use the display like an oversized iPad to bring up web pages, draw and swipe with their fingers to emphasize presentations, or connect a laptop and involve students in a class project. To ensure students leave class with accurate notes, they can even save the marked up exercises and email them. The interactive displays are the next generation of technology, replacing the projectors and whiteboards now in use in most district classrooms. Newline executive Chris Bradford, who joined teachers for the training session, said the technology, about three years old, is becoming the classroom tool of choice for educators for its ease of use and the capability it gives teachers to use a variety of software platforms. What do students think of the displays? Bradford says today’s students, who have virtually grown up with touch technology in tablets and smartphones, welcome seeing it finally arrive in their classrooms.